Oh, how we love books set in Scotland! 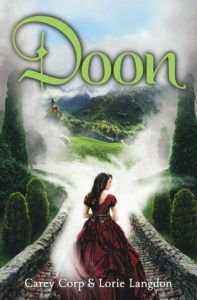 LORIE & CAREY: Doon is the story of two best friends from the mid-west, a Harry Potter nerd and a drama geek, who travel to Scotland and discover an enchanted kingdom that appears once every hundred years. CAREY: Not exactly. More like Lerner and Loewe’s Brigadoon. Although Lorie had read the series, I actually didn’t read Outlander until after we’d written the second book. We were doing a big book festival with Diana Gabaldon, so I read the first book and fell in love. Doon has been called Outlander for teens which makes me happy. LORIE: I concur! It is a HUGE compliment to have any comparison to Outlander. However, our story isn’t based on Outlander at all. The main similarities are that they are both set in Scotland and one of the heroes is named Jamie. I chose this name in homage to Jamie Fraser. Little did I know, the Outlander TV series would release around the time of our second book, forever linking the name “Jamie” with Scottish fiction. The enchanted land of Doon feels suspiciously like the Highlands. But it’s set in the south of Scotland (a.k.a. NOT Highlands country). What gives? CAREY: Oh, you noticed that? Well we really wanted to keep the highlands feel of Brigadoon. However, the actual Brig o’ Doon is located in Alloway, Scotland – nowhere near the Highlands. But what if? What if the Highlands used to extend farther south? And what if that topography vanished along with the Kingdom of Doon when it was placed under its protective enchantment? 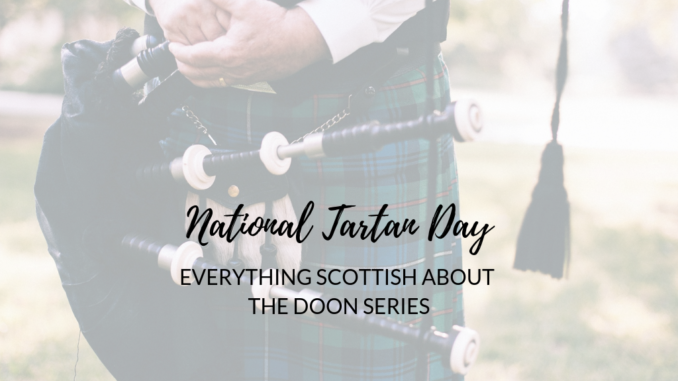 In honor of National Tartan Day, what, in your humble opinion, is the most Scottish thing in the Doon Series? CAREY: Creating a fictional clan. Did you know that Scottish clan identifiers (tartans, crests, mottos, and such) are proprietary? Yep. 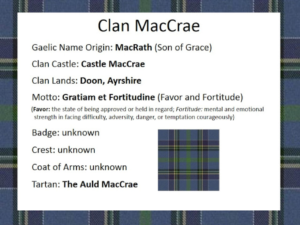 We spent a great deal of time looking at Clan profiles and then creating our own fictional one for the Clan MacCrae. Your series isn’t just fictional. Tell us about the actual history interwoven into the series? LORIE & CAREY: We’re secretly history nerds. As we researched, there was so much synergy between actual Scottish history and the fictitious timeline leading up to the disappearance of Doon. If you read carefully there are Easter eggs leading to Robert the Bruce (who coined the phrase “If at first you don’t succeed, try, try again”) hiding in the caves of Doon, to the Scottish cannibal, serial killer Sawney Bean. The fictitious world of Doon also intersects with the Scottish witch hunts of the 1500s and is keeper of the real Coronation Stone (a.k.a The Stone of Scone or Stone of Destiny). England has a fake. LOL. Do you have Scottish things around your house? CAREY: Besides framed book posters of the series, I have fan art, kilted nutcrackers, Brigadoon on Vinyl, Scottish bookends, lots of plaid scarves, Scottish themed Lego characters, Celtic jewelry, and lots of bridge figurines. *points* BUT LORIE HAS A COSTUME! LORIE: Yes, I have a Scottish lass costume that I wore to NY ComicCon when we signed there two years ago. It was fairly tame compared to most of the amazing cosplayers there, but I loved it just the same! I am officially ready for National Tartan Day. So many of the books set in Scotland that we love focus on strong male leads? Tell us about the MacCrae brothers, the Princes of Doon. CAREY: Prince Duncan Rhys Finnean MacCrae is the sweet, sensitive younger brother. He’s deeply romantic, prefers trousers to kilts, and the sorting hat would assign him to Hufflepuff (which I’ve made my peace with). LORIE: Oh, we’re using full names? Okay, then. Prince James Thomas Kellan MacCrae is the eldest son in the royal family and has been groomed from birth to become the next king of Doon. He is a tortured bad boy with noble intentions. (My favorite type of hero.) He is focused and intense, but it’s only because he’s torn between what he wants versus what is best for his kingdom. Jamie is 100% Gryffindor. Which I recently discovered through the Pottermore test, so am I! CAREY: Why is it so bad to run with scissors? How are you celebrating National Tartan Day? What are some of your favorite books set in Scotland? 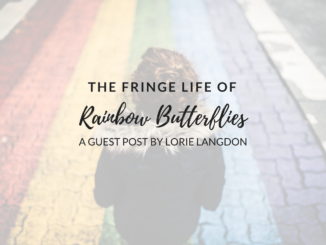 Lorie Langdon is the Amazon best-selling author of YA novels including the Doon Series, Gilt Hollow, and the historical retelling, Olivia Twist. She has been featured on such media outlets as; USAToday.com, NPR Radio, EntertainmentWeekly.com, RedbookMagazine.com, Girl’s Life Magazine, and BroadwayWorld.com. Her first novel, Doon, has over 2,200 five-star reviews on Goodreads and has been optioned for film by Dreamstreet and Lonetree Entertainment. She is a self-professed Wonder Woman Wannabe who lives in Ohio with her husband and two superhero- obsessed teenage sons. Carey Corp is a lover of reinvention, and wrote her first book – a Star Wars retelling – at the age of seven! In addition to the Doon Series, she is the author of several young adult novels, including Shades of Neverland. In addition to pouring her imagination into books, Carey is passionate about Italy, chocolate, musical theater, and Jane Austin. 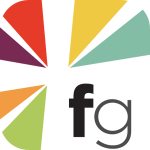 Page Chaser is operated by HarperCollins Christian Publishing, the publisher of the Doon Series. Winston Churchill Day: What Would Winston Churchill Read Today?